The whole gang can sleep comfortably in the Coleman 10'x10' Sundome Tent. Measuring a full 6 feet high at the center, the tent sleeps five people comfortably with plenty of room to move around. Coleman's exclusive WeatherTec system is packed with features to keep you and your tent dry, whatever the weather. The durable tub floor has welded corners and inverted seams, making it waterproof to keep moisture out. Leak-free rainfly seams, water-resistant fabric, and a weather-protected zipper guard are all specially designed to repel water and keep you and your gear dry. A strong frame design with 11mm shock-corded fiberglass poles are engineered to withstand stormy conditions. A mesh vent provides increased ventilation, to keep everything cool and comfortable. There are separate storage bags for tent, poles and stakes, with easy-to-follow instructions sewn right into the carry bag, so you'll always have them with you. 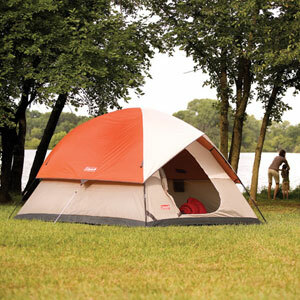 Roomy enough for the whole family, the Coleman Sundome tent sleeps up to five people at a time in complete comfort. The Sundome is outfitted with Coleman's exclusive WeatherTec system, a series of technical features intended to protect you from inclement weather and nasty storms. WeatherTec tents are built with a coated polyester fabric combined with anti-wicking thread, webbing, and zippers, all designed to keep you dry when the rain comes down. The tent's welded waterproof floor and inverted floor seams, meanwhile, dramatically increase the water resistance by hiding the needle holes inside the tent and away from the elements. And in addition to offering fully taped rainfly seams, the included rainfly covers the doors and windows tightly and incorporates easy-to-use Velcro frame attachments. In fact, Coleman is so confident in its WeatherTec system that it exposes its WeatherTec tents to a rain room that simulates nasty downpours, and to a wind machine capable of blowing hurricane force gusts. The results? Even after the tests, Coleman guarantees its WeatherTec tents will keep you dry. The Sundome's interior is notably spacious, with a base that measures 10 feet by 10 feet and a center height of 72 inches--plenty of headroom for most people. In addition, the tent is engineered to keep you cool thanks to the adjustable Variflo ventilation and vented Cool-Air port. Best of all for travel-weary campers, the Sundome sets up quickly, with two shock-corded steel poles, continuous pole sleeves, a pin-and-ring design, and InstaClip attachments. The tent even comes with easy-to-follow instructions sewn into the durable carrying bag. Other features include a heavy-duty welcome mat, a single door, separate bags for the poles and stakes, a privacy vent window, an interior gear pocket, and an electrical access port. The Sundome tent sleeps up to 5 people comfortably.